Dr. Fricker’s research interests include spatial ecology, forest community ecology, environmental modeling, active remote sensing (LiDAR) and imaging spectroscopy (hyperspectral imagery), Geographic Information Systems (GIS) and computational geography. He has spent more than eight years in working for non-profits, startups and multinational corporations in the commercial mapping and surveying industry and three years working as a researcher at NASA’s Jet Propulsion Laboratory. By researching plant communities he applies lessons learned about microclimates and landscape scape resource gradients to predict how plant communities are shaped through time and space. 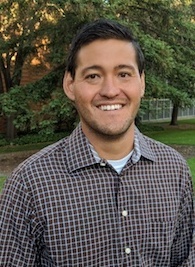 He’s also currently working with the Kauai Forest Bird Recovery Project to model the population distribution of critically endangered birds in northwest Kauai and applying spatial modelling and machine learning techniques to conservation. He has an active interest in applying new computer science methods to geospatial data and utilizing new data streams like CubeSats, next generation LiDAR and hyperspectral imaging sensors. He enjoys teaching his students technical job skills (GIS, Remote Sensing, Data Analysis) and helping them find internships and jobs after graduation. He enjoys camping, surfing and fishing along the west coast from Baja to British Columbia (and everywhere in between) with his wife Haylea and dog Adele. Fricker, G.A., Wolf, J.A., Saatchi, S.S., & Gillespie, T.G. (2015) Predicting variation of tree species richness in tropical forest landscapes using high spatial resolution remote sensing. Ecological Applications, 25(7), 1776-1789. Fricker, G.A. Saatchi, S.S. Meyer, V. Gillespie, T.W. & Sheng, Y. (2012). Application of semi-automated filter to improve waveform lidar sub-canopy elevation model. Remote Sensing, 4, 1494-1518. Gillespie, T.W., de Goede, J., Aguilar, L., Jenerette, G.D., Fricker, G.A., Avolio, M.L., Pincetl, S., Johnston, T., Clarke, L.W. and Pataki, D.E., (2017). Predicting tree species richness in urban forests. Urban Ecosystems, 20(4), 839-849. Keppel, G., Gillespie, T., Ormerod, P., & Fricker, G. A. (2016) Habitat diversity predicts orchid diversity in the tropical Southwest Pacific. Journal of Biogeography. 43.12 (2016): 2332-2342. Gillespie, T.W., Fricker, G.A., Robinson, C., & Rocchini, D. (2015). Biodiversity of the world: A study from space. Land resources monitoring, modeling, and mapping with remote sensing. In P. S. Thenkabail (Editor), Remote Sensing Handbook (pp. 489-503). Oxford, UK: Taylor and Francis. Meyer, V., Saatchi, S. S., Chave, J., Dalling, J., Bohlman, S., Fricker, G. A., Robinson, C., & Neumann, M. (2013). Detecting tropical forest biomass dynamics from repeated airborne Lidar measurements. Biogeosciences, 10(2), 1957-1992. Wolf, J.A. ; Fricker, G.A. ; Meyer, V.; Hubbell, S.P., Gillespie, T.W. & Saatchi, S.S. (2012) Plant species richness is associated with canopy height and topography in a neotropical forest. Remote Sensing, 4(12), 4010-4021.